Accidents happen. When they do, you want a trusted friend to help you through the process of getting your assets back up and running as quickly as possible. Friends like Scott Cerosky, founding member of NAPSA and the World Sweeping Association , who has written numerous industry-specific risk management and insurance-related articles for industry publications. He has dedicated the last 20 years to helping businesses manage their risk. 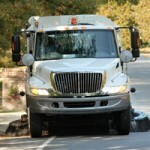 Founder of the Clean Streets program, Cerosky is serving as a consultant for Fairmont Specialty’s Street Sweeper/Pavement Maintenance Program. Cerosky is drawing on decades of experience in the industry to help develop a program to enable business owners better manage their risk. This national insurance program offers specific coverages and enhancements that can be customized to fit your business. Fairmont Specialty offers a variety of services such as driver training programs at no additional cost to the client to help lower claim activity. • Acord 125 and all lines of requested coverage. • 5 years of currently valued loss runs. • Please include on the Acord auto application the “stated value” on all sweepers and pump trucks. We will use “cost new” on all other vehicles. Include the sweeper equipment manufacturer/model in addition to the cab and chassis manufacturer. Fairmont Specialty is a registered trademark of United States Fire Insurance Company (“U.S. Fire”). Policies in the program are underwritten by U.S. Fire or one of its affiliated insurance companies.